#IrishAbroad: Two Irish animations win at the 23rd International Film Festival Schlingel - Two Irish animations, Captain Morten and the Spider Queen and The Breadwinner, won awards at the 23rd International Film Festival Schlingel in Germany. #FilmFleadh: Captain Morten and the Spider Queen to have Irish Premiere at the 30th Galway Film Fleadh - Captain Morten and the Spider Queen, the first stop-motion animated film made in Ireland will make its Irish premiere at the forthcoming Galway Film Fleadh on July 15th. 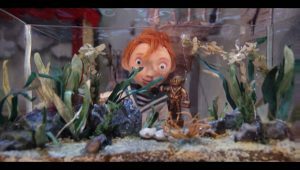 #IrishFilm: Morten, Ireland’s first stop-motion feature, to commence production at Telegael - Morten, which is slated to commence production at Telegael’s studios in Baile na hAbhann, Galway on Sep 19th, will be Ireland's first stop-motion feature.